I fully intended to make my own wedding dress. I chose some incredible hemp/silk fabric and couldn't wait to see and feel the yards of shimmery material and turn them into something magical. I've made loads of clothes, including fairly elaborate costumes, so how would this be any different? There was some delay. I had the muslin, but more important matters kept me busy all the time. My sister bought her bridesmaid dress. We joked about how I had better get going, wouldn't want a naked bride! 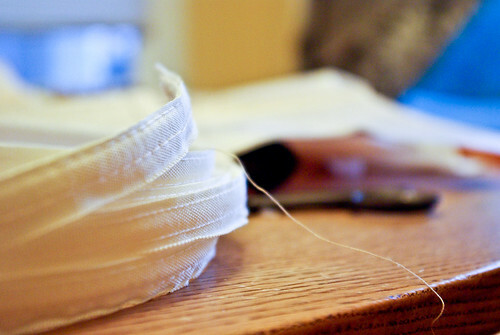 My sewing kit traveled with me across the country to Arizona, where I reasoned I would have all the time necessary to devote to wedding dress sewing. I got as far as a heavily boned muslin bodice. 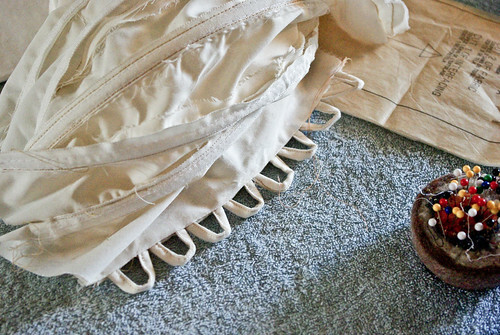 I kept sewing seams backwards, and trying to figure out how to make elegant lacing loops nearly drove me to tears. My mom and I made a duct tape dummy, which in my confusion I considered absolutely necessary to the getting started process, but which ended up being more of an additional procrastination (albeit a very funny one, and also a good objective way to self-analyze - no denying the potbelly when its right there as a duct-tape bubble). The last straw was accidentally buying quilting thread, which the sewing machine I was using refused to work with, making a single straight seam something to celebrate. I packed my supplies away and decided to attack again when I returned home. During our trip back we made a stop with C's family. My future mother in law suggested checking out a very cool bridal store. 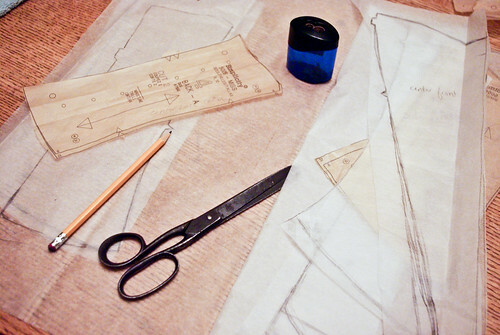 "Oh, no," I said, "I'm making my dress." Then I started to think. I called my mom and she reminded me how little I had been enjoying this process. "Maybe just go look?" she suggested. We went and I very nearly walked out with the first dress I tried. In the end we chose a different one, but I went home with a dress. Now I keep telling everyone how inexpensive it was in order to justify changing my mind; I am turning into the definition of tacky. I feel like I've let myself down, like I gave up my creative ideas as I have done in many other areas around this wedding as costs and general practicality* have set in. But in actuality, I love my dress. It is absolutely gorgeous, it makes me feel gorgeous and I feel good knowing where it came from. I was not enjoying the sewing process at all and trying on fabulous dresses while people tell you how pretty you look is a terrific way to spend an afternoon. Also, did I mention I got a great deal?! * in all honesty, sewing my dress was also sort of a cost based decision, as there is no way I thought I could ever afford a dress of the quality fabrics I love. Seriously, if you are anywhere near VA check out Church St Bridal! It sounds like letting go of the dress-making process was a good move for you. I'm glad you found a dress you love and eliminated such a stressful project. Maybe now you will enjoy your wedding-planning a little bit more?